CFHL planned to recruit the 50 Junior Officer Posts through written exam. Candidates who qualified Degree and having Computer Knowledge and typing skills they can apply online for this Can Fin Homes Ltd Junior Officer Posts. These CFHL Junior Officer Posts are purely contract basis for one year. It will be renewed every year depends upon the requirement or candidates performance. Candidates selection for this CFHL Junior Officer recruitment is based on written exam, personal interview and candidates work experience in any. 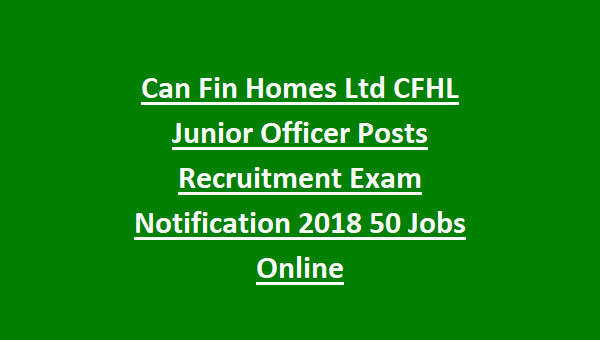 More details about this Can Fin Homes Ltd Junior Officer jobs exam pattern, exam syllabus, online form submission procedure and other details are given below. Online application link activation dates are 19-09-2018 to 29-09-2018. Written exam or interview dates, admit card dates will be updated soon. 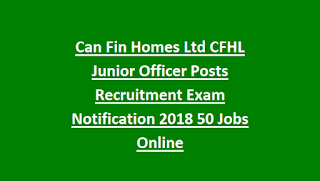 There are total 50 Junior Officer vacancies in this CFHL recruitment. As on 01-09-2018 age limits for general candidates is 21-30 years and for reserved candidates age limits are applicable as per the norms. Selection candidates will receive Rs.16000/- for first 12 months. If contract is renewed salary will be increased as per the CFHL norms. Candidates must have qualified degree and having knowledge of computer applications they are eligible to apply online. Candidates selection will be based on written exam and interview for this CFHL recruitment. For General and OBC candidate application fee is Rs.100/-. Candidates can apply online for t his CFHL Junior Officer posts on or before 29-09-2018. Official website to submit application form online is www.canfinhomes.com/job. Admit Card, Exam syllabus and pattern, exam result and other details available in this website only.